Infectious diseases continue to be an enduring threat to human survival and well-being. The recent Ebola epidemic in Western Africa has revealed a number of limitations at every front, including lack of timely response, improper disease surveillance, failure of national governments to control epidemics and most importantly, the failure of the pharmaceutical industry to develop a single effective drug for a disease which is known to be so deadly since the last four decades. This is indeed an early warning for other deadlier future epidemics which may soon emerge. Continuous research on new potent anti-infective drugs, and efforts to understand infections at the molecular level to identify new drug targets are urgently needed. 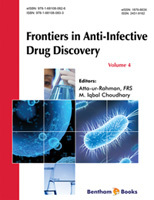 The 4th volume of the eBook series “Frontiers in Anti-Infective Drug Discovery” is therefore timely and important. It is a compilation of five well written chapters, contributed by leading practitioners in the field. The chapter by Fornells and Couceiro provides details of the emerging resistance against flu treatments with anti-neuraminidase drugs. The presence of mutations in the influenza virus, responsible for producing resistance against anti-neuraminidase drugs, is discussed in detail. Drug repositioning is an important approach for drug discovery and development. Oliva et al. have conducted extensive studies on the use of the anti-depressant drugs, such as phenothiliazines as anti-trypanosomal drugs. Trypanosoma cruzi is the causative agent of a common parasitic tropical disease, called Chagas disease. These well known anti-depressant drugs exert their trypanocidal effects by inhibiting trypanothione reductase, an enzyme which is essential for the redox defense system of the parasite. This article provides strong support for the drug repositioning / repurposing approach, i.e. for finding new health benefits in old drugs. Bouriotis et al. have reviewed the current state of research with respect to bacterial polysaccharide deacetylases as drug targets for antibacterial drug development. Polysaccharide deacetylase plays an important role in the bacterial life cycle, and its inhibition is an important approach towards the development of new anti-bacterial drugs. Revuelta et al. present a review on the potential of RNA-binding drugs as anti-infectious agents. They describe the use of positively charged aminoglycoside class of compounds that bind with ribosomal RNA, and can serve as anti-bacterial agents. These compounds can also be used as antiviral drugs against other diseases. Finally, Boso-Ribelles et al. have contributed a comprehensive review on the changing landscape of antibiotic development, which does not seem very promising. They summarize the outcomes of several drug discovery initiatives, new antibiotics in the pipeline, and current state of research on old drugs to develop new antibiotics. This chapter, in brief, is a charge sheet on the negligence towards this important field, which is now causing tremendous human suffering. This volume is the result of hard work of many eminent researchers. We wish to express our profound gratitude to them. We would also like to acknowledge the dedication and hard work of the excellent team of Bentham Science Publishers, led by Mr. Mahmood Alam, Director of Bentham Science Publishers. The efforts of Ms. Fariya Zulfiqar, Assistant Manager Publications, deserve special appreciation.